For a long time, point contacts have been used in microwave engineering as detectors, rectifiers, mixers, and harmonic signal sources. Such contacts are usually formed by means of thin wire pressed against a smooth semiconductor or metal surface. The wire represents a kind of antenna to couple in the radiation. A high-frequency current penetrates in the bulk of contact through this wire. An outline of the experimental configuration for the light or high-frequency irradiation of point contact is shown in Fig. 10.1. As the contact resistance is much smaller than the surrounding environment impedance, the high-frequency radiation produces a high-frequency current in the leads. Inasmuch as the I – V characteristic of a point contact deviates from the Ohms law, in other words, it is strongly nonlinear both in the thermal and the ballistic regime, the contacts independent on the current regimes can be used as a tool for rectifying, mixing of electromagnetic signals, and so on from the microwave up to optical frequencies. 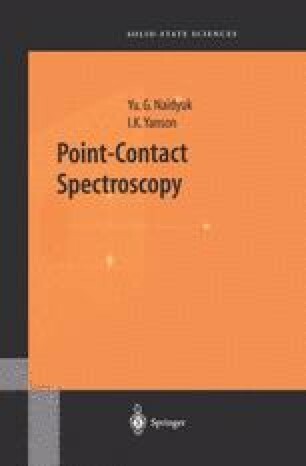 Consequently, a microscopic physics of processes in the contacts under the influence of irradiation evokes considerable interest.